While I don’t have any formal photography training, to say that I enjoy taking pictures is an understatement. I’ve been obsessed with digital photography and filmmaking ever since I picked up my first Olympus 2-megapixel camera, and that love has carried me through years of point-and-shoots, DSLRs, and phones. Now, I think the world of my Canon Rebel and its 40mm pancake lens. I’ve gotten some incredible pictures from that camera. But the more I carry around my iPhone 6, the more I’m convinced that its days of hanging out in my bag are almost over. Because the iPhone 6 is a mighty fine camera, indeed. I took my 64GB iPhone out and about on Friday to stress-test some of its new camera features and see if I could get some similar results to Apple’s promo photography. Here are some initial reactions. Apple loves to brag about the innovations it’s brought to CMOS sensor technology, and this year’s event was no different. The big buzzwords of the week have been image stabilization and Focus Pixels: One automatically snaps multiple photographs and merges them to create the clearest picture available; the other dynamically focuses during video shoots to keep whatever you’re framing in focus at all times. What you have to look forward to in this test: lots of nerdy gadgetry and tchotchkes in pictures. Let’s get this out of the way: Both these technologies are ridiculously cool in practice. I say “ridiculously cool” in part because they occur so seamlessly that the average person isn’t going to know why their pictures and video suddenly look better on the iPhone 6—they just know that their pictures and video do. But also, as a tech lover, the amount of processing and photomagic going on behind the scenes is incredible. Now, I opted for the “baby” iPhone of the new line, the 6, which means I didn’t get to play with the 6 Plus’s optical image stabilization. But the 6’s digital stabilization efforts are nothing to sneeze at. If you’ve shot with an iPhone before, you know how much of a drag it can be to capture moving subjects: I’ve failed to capture many a perfect animals-or-children moment because they moved too fast and my iPhone snapped too slowly. The iPhone 6 doesn’t fix this problem entirely, but it certainly makes it a whole lot less prevalent—especially in good lighting conditions. To begin my iPhone photography tests, I targeted the most fickle of subjects—my friend Emily’s cat, Fox. Her cat is a sweetheart, but man oh man does he like to move around. What better way to test the new camera’s image stabilization than trying to move around after him and snap photos? 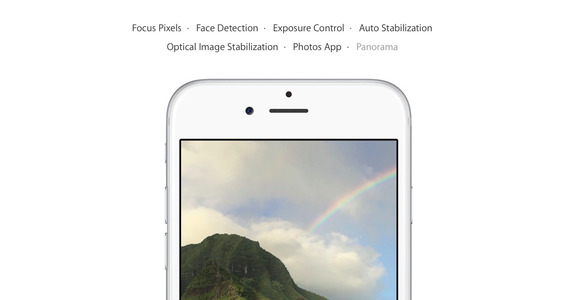 According to Apple, your device “digitally stabilizes” an image by taking four images with short exposure times in a row and combining the best parts of each to create as clear and crisp an image as possible. It’s very similar to how your phone’s HDR (high dynamic range) setting works, and thankfully, Apple’s speed improvements for snapping quick HDR images also carry over here. Not every picture is going to be a winner—I still had to take several pictures of Fox roaming around before I got the beauty up above. There’s definitely some shutter lag when either you or your subject is in motion. Snapping pictures of Fox the cat caused very little delay—I was even able to fire off a few Burst mode tests—but once I started shooting candids at my roller derby team’s evening fundraiser, I ran into some slowdown. Combining movement and low-light is a wee bit taxing; your phone’s going to want to take pictures with a longer exposure time to avoid blurry subjects, and when it’s trying to take four of those images in a row for stabilization purposes, it’s going to be a few seconds before you can snap the next picture. For candids, this was no real problem—most everyone’s used to standing still momentarily to take a picture on a smartphone—but trying to take pictures of low-light subjects in motion is still a pretty terrible experience. Even with the iPhone 6’s TrueTone flash, our dance floor was, in real life, a whole lot less blurry than this. All that said, my DSLR isn’t fantastic at snapping quick low-light motion shots without a good flash, either—it’s impressive that the iPhone can pick up as much detail as it does. And when subjects are well-lit, the results can be downright spectacular. Your iPhone 6 self-portraits may not be any less pixelated than their iPhone 5s versions, but both the lighting and fill are better. The iPhone’s front-facing FaceTime HD camera is often neglected in the pomp and circumstance of new camera features: Its diminutive 1.2-megapixel camera and tiny sensor give it little room to compete with the back camera’s 8-megapixel sensor and sapphire lens. But that doesn’t stop Apple’s users from loving this little bit of tech: selfies and FaceTime have made this camera just as important to a subset of iPhone aficionados. So while the iPhone 6’s front-facing camera isn’t suddenly the most impressive selfie camera on the road, it packs a few nice features for the trip. The lens now has a f/2.2 aperture, same as the iPhone 6, and offers Auto HDR, burst mode, and exposure control for would-be selfie-takers. I couldn’t get HDR to officially trigger or display the “HDR On” button when shooting with the front-facing camera, but the resulting light-contrasted images I shot looked remarkably improved upon anything I’d shot with my iPhone 5s front camera. It’s not to say that you should start using the front camera for everything under the sun, but it has become more of an option if you want to snap a decent picture without turning on the Timer or asking a passerby to take a photo. Surprising no one, front-facing burst mode is hilariously fun. Secretly, I hope this means the return of the Photo Booth app down the line—as a Camera Extension if nothing else—as the only thing missing from my goofy shoot with Fox was a fake green-screen background of scuba divers. I’m mostly going to let the demo video I took (starring Hayley Contagious of the Boston Derby Dames) speak for itself. We shot, cut, and posted this in under two hours, using only an iPhone 6—no tripod, no Steadicam, no accessories. In fact, every shot you see in that video was with me running around in boots following Hayley’s motion—I wasn’t even on skates to try and stabilize the camera. Whether there’s enough light for your regular or slow-motion shot. Obviously, there are things that can make an already good shoot even better, good lighting being one of the big ones. But you don’t desperately need pro-level knowledge or fancy equipment to shoot really good-looking video, and that’s incredibly exciting to me on both a user-friendly and professional level. Personally, I can’t wait to see what independent filmmakers create with the iPhone 6 in the next year. I could (and probably will) write a whole other article about iMovie for iOS’s new speed controls, but briefly: You can now add multiple speed modulations to a single clip without having to split that clip, and that editing process is delightful and super-simple to execute. If nothing else, it just got that much easier to post slow-motion videos to Instagram. As I said above, I don’t expect many iPhone 6 or 6 Plus users to openly marvel over Focus Pixels, Apple’s technology for keeping your video subjects continually in focus. The focus shifts during a video are subtle, smooth, and keep your eyes from wandering or being pulled out of the image. They’re not the kind of thing you’d exclaim and point out if you don’t regularly shoot video. But the end results are just fantastic. I did a couple of early tests with my friend Emily and her ukelele, physically moving the iPhone around her while she played—and the camera had no trouble locking and keeping the primary focus. It’s remarkably good at figuring out what might be important to the scene, too—even if that object isn’t in direct center of the frame. I only had to manually tap for focus once during the several tests I didin both regular and low-light). It’s worth noting that Apple’s Focus Pixels tech doesn’t seem to work as well (if at all) while in Slo-Mo mode; I found myself repeatedly having to manually focus certain areas during my slow-motion video tests. These three features haven’t gotten a whole lot of love from Apple this go-around, although you can now take up to 43-megapixel panoramas for even more detail in your landscape shots. But I did a few test shots anyway, just because. Your digital zoom essentially is the equivalent of cropping a full-frame iPhone picture, so there’s only so much you can do with it before it starts to look pixelated. But Apple’s light improvements to its sensor give pictures a little more to work with, and this zoomed picture benefits from that. The iPhone 5s also had an f/2.2 aperture, so you won’t see much of a difference in macro shots between it and the iPhone 6. That said, automatic image stabilization seems to help improve the crispness of macro photos on the 6—which can be useful if your hands are less than steady. I’m going to be doing further tests with the iPhone 6 camera; if you want to follow along, check out @macworld and my Instagram account @settern.